Our Hydrographic facility currently boasts a film library of over 300 different patterns, including the popular carbon fiber, brushed aluminum and wood grain finishes. The carefully controlled application process is ideally suited to the complex shapes of vehicle components like dashes, instrument panels, consoles, hood scoops, engine covers and door handles. 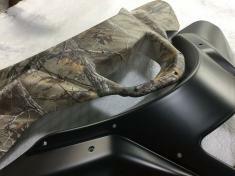 Ground Effects continues to diversify into the recreational market with components on Honda and Yamaha ATV's, Dino and Ranger Boats, accessories and sports equipment from Warrior Sports.